In my former life as a restaurant reviewer I covered, among other things, the cheap-eats beat. I got started on this beat by doing reviews for Portland Best Places, which led to Cheap Eats, a book I edited and wrote plenty of reviews for, which led to a couple of years spent contributing to a weekly feature in the Oregonian. It was a good gig at the time, as my children were young and living on a budget already dictated the kinds of restaurants we frequented. I’ve also always been a sucker for those treasures in the rough: Four-for-a-dollar Italian plates and lambswool sweaters at Goodwill, $5 garage-sale chairs, a plate of carnitas tacos from the Mexican food truck. My children are older (but still young), and living on a budget seems to be a lifestyle rather than a passing phase. Especially at this time of the year — post-holidays, pre-taxes. 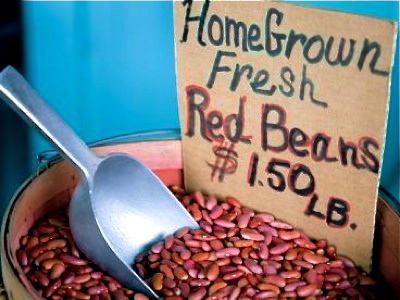 [%image "reference-image" float=left width=400 credit="Photo: iStockphoto/Typogigo" caption="Beans are a bargain compared to most meat."] Building meals around cheap protein is the easiest way I know to pare down the weekly grocery bill. By "cheap protein" I mean beans, eggs, or meat — tough cuts, on sale, or packages dug out from the back of my freezer. As for food themes, I often pick one and then cook in large quantities for multiple meals. The trick, of course, is to keep it fun. Burritos every night are not fun. But a big pot of beans that gets morphed into soup and enchiladas? A riot. Week to week, in winter at least, the routine is similar. On Monday I put a pot of beans on the stove — last week it was garbanzos, this week black turtle beans — and season them once they're cooked. To Monday’s pot of black beans I added sautéed onion and garlic, ground cumin, oregano, chipotle purée, and salt. This I served over rice with warm corn tortillas and a simple cabbage slaw. It was tasty and well received; I said a silent prayer of thanks to the patron saint of cooking parents. To serve the same meal twice I knew would invite mutiny. So I leafed through cookbooks (my favorite part of cooking) and contemplated the possibilities: Black Bean and Bacon Tacos (Rick Bayless), Black Bean Cakes (Deborah Madison), and Brazilian Black Bean Soup (Mark Bittman), not to mention various riffs on chili, enchiladas, and tostadas. In the end, I made burritos. As I was sprinkling leftover rice and grated cheese onto the flour tortillas (patting myself on the back for such foresight and efficiency), my daughter wandered into the kitchen. “If we’re having burritos, make mine without beans, please,” she said. “Without beans? !”  My voice was sharper than I intended. The troops obviously were not going to fall in, and this was only day two. Day Three. After a lunch of black beans and rice, I’m sick of black beans. I divide the spoils into two containers for the freezer, thinking we’ll enjoy those bean cakes and enchiladas down the road, when our appetite for black beans is fresh, and each meal is individual instead of the same ingredient reworked day after day. Dinner tonight is pizza. To save money, I don’t invite my husband. On Thursday, I turn my attention to soup, another inexpensive and filling meal, made Italian-style with pasta and beans. This time the beans are borlotti, or cranberry beans, and there aren't so many of them. When the kids protest, I keep a straight face. “Those aren’t beans,” I say, “they’re fagioli.” When they persist, I switch to French: “Haricots!” They seem indifferent, so I repeat myself, only louder. Lady Luck, however, is on their side, because by the time I put my computer to sleep and those old beans are actually tender enough to add to soup, I’ve lost interest. It’s 7 o’clock and I don’t feel like dicing onions and celery. I pull some tomato soup from the freezer (the spoils from a big pot made weeks ago) and put a fire under the griddle for grilled cheese and pickle sandwiches, while my husband slices apples, sets the table, and pours the wine. We’ll make pasta e fagioli over the weekend, dividing the vegetable prep between the two of us. Two onions plus one bunch of celery and a pound of tomatoes will yield enough soup for several meals next week, or at least until we tire of it. Then Friday arrives. And I realize I have become that woman I never understood as a child, the one who gets very excited about dinner out on Friday. No dice, though; that card has already been played. Think cheap, filling, and straightforward. The kids will be thrilled and making breakfast for dinner feels like cheating, in a good way. Not exactly dinner out, but a bag of sweet Rainier strawberries rationed from the freezer is nothing to scoff at. Though it may not be a night off from cooking, it will, at least, be a day without beans. Until Sunday or Monday, that is, and I’m already plotting. Cannellini. Puréed with garlic and wilted greens on toasted bread. Cheaters’ cassoulet (for time-starved, penny-pinching, non-French moms): a gratin of beans with bits of sausage, topped with breadcrumbs. Perhaps I’ll toss some beans with a lemon vinaigrette, diced shallots, and tuna and sun-dried tomatoes from the pantry. From where I sit now, anything is possible. And if that pot of beans turns into nothing more than soup seasoned with onion and a little ham, or a couple of containers for the freezer to evolve into future meals, so be it. We’re living within our means, eating beans.